Click on the ship to activate the guns. Target and shoot down 4 airplanes. Click on the “Drive Slow” sign to remove it. Place the sign with the nails pointing up onto the road to stop the speeding criminal. Locate the ice pick next to the tree and click on it to pick it up. Use the ice pick on the ice to create a hole. Pick up the branch by clicking on it. Using the branch, tap the nest to reach the egg. Click each race car part to drag them to the appropriate location in the grey car outline. Click the large cage to drop it. Click the medium size cage to drop it. Click the small cage to drop it. All cages need to be lowered at the same time to open the door. Find and pick up the key located on the windowsill by clicking on it. Use the flute on the basket. Turn all of the puzzle pieces to complete the puzzle. Click on the telescope to view the rooftops. Click on the knight so he lowers his joust and you win the game! Click on the leaf to pick it up. Place the leave in the water. Click on the fruit so that it drops onto the leaf. Click on the rifle to pick it up. Click on the bottles to shoot them down. 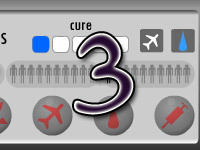 Move your cursor over the bubbles to pop them for additional score points. Find the roman numerals on the posters on each floor. Complete the code on the second floor using the roman numerals from each floors posters. Blue Roman numeral (V) on the third floor is 5. Yellow Roman numeral (IV) on second floor is 4. Red Roman numeral (II) on first floor is 2. Pick up the key by clicking on it. Click on the box to find the ball. Pick up the ball by clicking on it. Using the key, click on the cage to open. Use the ball to lure the kitten out of the cage. 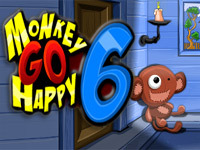 You have now completed ever level of Monkey Go Happy Marathon! Congratulations! !